Did Manufacturing Job Losses Hold the Midwest Back? There is a strain of thought among some policy experts that manufacturing, especially in the Midwest, is a dead-end for regional economic development. In a series of recent Brookings reports, my co-authors and I have challenged that view. The conventional wisdom won’t die easily, though. The most recent defense of the conventional view comes from Richard Florida, who claims that a heavy reliance on manufacturing has held back economic growth in Midwest metropolitan areas. Florida shows that Midwest metropolitan areas where manufacturing made up a large percentage of total employment in 1969 generally had the slowest job and income growth over the next 40 years. If you end the story there, it seems that manufacturing hindered economic development in the region. However, there are several more chapters to that story. Midwest metropolitan areas where manufacturing accounted for a large share of total jobs also had the most severe losses of manufacturing jobs, as the chart here shows for the period 1970-2010. Metropolitan areas in the Midwest that had the most severe losses of manufacturing jobs also had the slowest gains in non-manufacturing jobs. Their slow growth in non-manufacturing jobs, coupled with their heavy losses of manufacturing jobs (which, of course, accounted for a large share of their total jobs in 1970), meant that the most manufacturing-specialized metropolitan areas were the ones that had the slowest overall job growth. Heavy losses of manufacturing jobs were associated not only with slow overall job growth but also with slow growth in the high-wage advanced service jobs (jobs in the professional service, financial, and information industries), where much of Florida’s “creative class” works (See chart). Looked at this way, the data show that manufacturing and non-manufacturing jobs, and manufacturing and advanced service jobs, are complements, not rivals. If anything, manufacturing job losses that held the Midwest back. This shouldn’t be surprising. Manufacturers, more than non-manufacturing industries and even advanced services, are regional export industries that bring in income from outside a metropolitan area. The decline of export industries such as manufacturing holds back growth in local-serving industries, which account for the majority of jobs in all metropolitan areas. In addition, metropolitan areas that lose manufacturing jobs also lose much of their ability to innovate in services as well as in manufacturing; as we showed in a previous Brookings report, manufacturing employs more than a third of all engineers and accounts for about two-thirds of all industry-financed R&D. 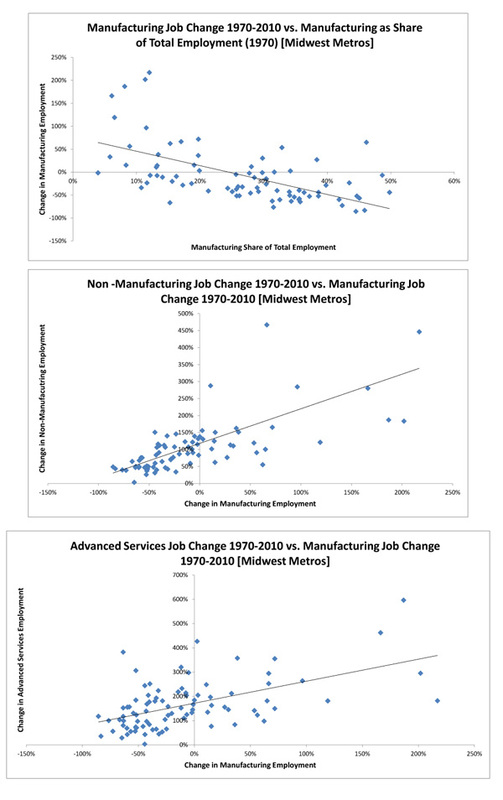 Causation can run in the other direction, too: the growth of non-manufacturing jobs in a metropolitan area can promote the retention of manufacturing jobs. Manufacturers, especially of new and high tech products, often need to locate production near R&D facilities and engineering consulting firms. It’s also possible that such metropolitan characteristics as a skilled labor force and good highway access promote the growth of both manufacturing and non-manufacturing jobs. The bottom line is that the retention and growth of manufacturing employment go hand-in-hand with the growth of non-manufacturing employment, including advanced service employment. Policies to strengthen manufacturing in the Midwest’s metropolitan areas will strengthen the rest of those areas’ economies, and vice versa. Of course, strengthening manufacturing hasn’t been a policy priority in the United States or its metropolitan areas during the last four decades. If anything, public policy has encouraged the offshoring of manufacturing jobs and the hollowing out of America’s production capabilities. We now have a chance to reverse course. Doing so can only benefit the Midwest’s metropolitan areas.